The Un-Official Blog of Romance Author Maddie James: An Adoption! Wow. I'm both excited (almost giddy actually) and nervous at the same time. I've decided to adopt! No, not a child. I'm not that insane. I'll stick with grandchildren at this stage of the game. 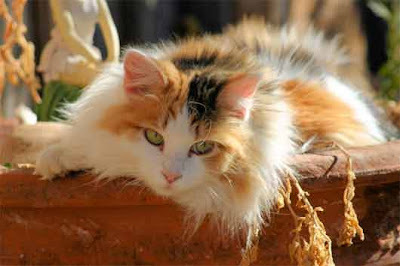 But I could very soon become the (unexpected) Mommy to a little baby Calico kitty! I've been thinking about a pet for a while. I've been thinking cat and dog. One of each. Probably not best to jump into both at the same time though. I figured the opportunity would present itself. You see, I believe that cats, in particular, find their owners. Somehow. I also believe that when I'm ready for the dog, she/he will come to me, as well. Tonight, I received an email from my friend Jan, who knows I've been pondering this pet thing for a while. Her daughter, the vet, has a baby Calico kitten who needs a home, and well... Jan, is just sure that this kitten is mine. So guess what. I think she IS mine. So I'm a teensy bit excited. Okay, more than a teensy bit. But just apprehensive about the next couple of weeks. I mean, bonding is important in the early stages of life and well, I really don't feel good about leaving the baby alone for a few days... Poor thing! But I do know that cats take good care of themselves. But she's just a baby! Okay, we'll work it out. And before we know it, she'll be a big Mama Calico just like this one.... (maybe, sorta...I haven't seen her yet so don't know exactly what she looks like). Well, this is news. What fun! Congratulations! Want a baby chick to go with the cat? I'm overflowing. Good luck with your new addition. I hope the pitter-patter of little paws brings you much joy. Thanks, Lisa! I think the little one will bring me a lot of joy. My last pet was Miss Kitty Marie and we had her 12 years or more. I'm ready! I think I may name her Caliope, but I'll know for certain after I see her and spend time with her.